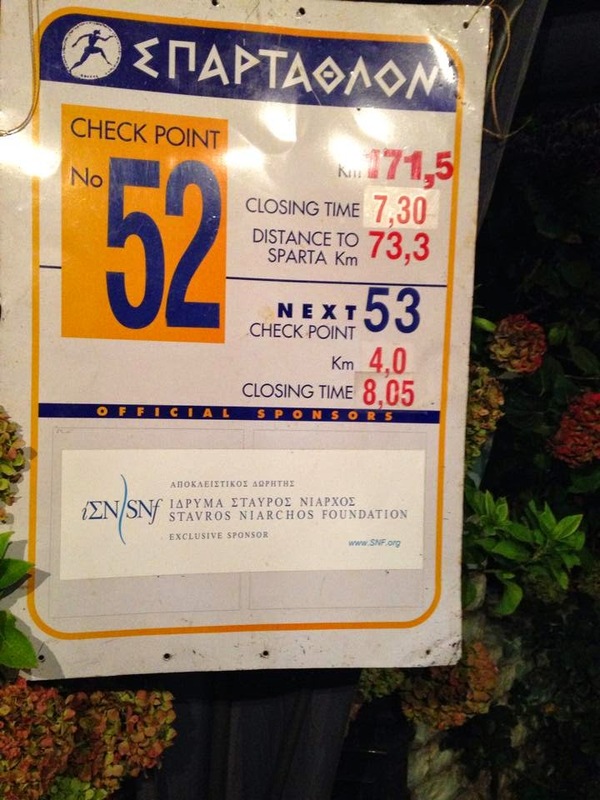 Spartathlon offers 75 Checkpoints with strict cut-offs throughout its 246K route. If you want you can leave dropbags at each of these CPs and run the race without any support. But to be able to make a sound dropbag plan, it's important to run the race before or at least to have some really good course knowledge. Support crews, on the other hand, can access their runners in 14 predetermined points. 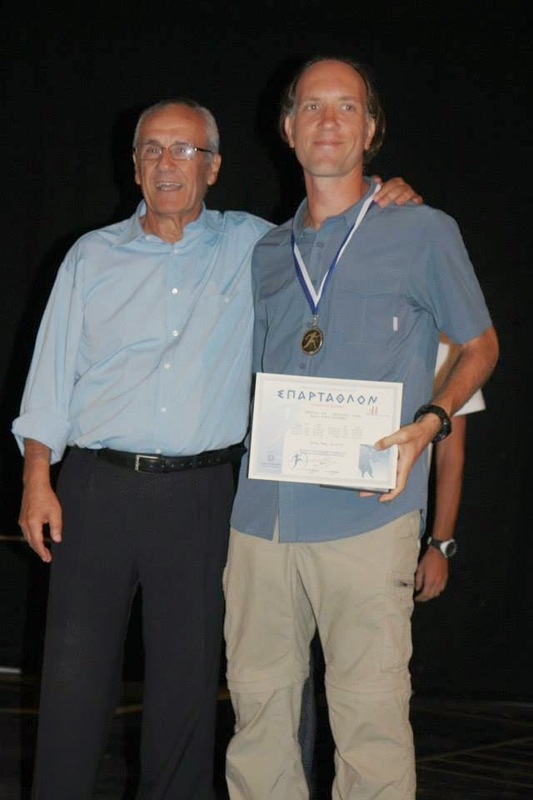 When I announced my participation to Spartathlon 2014, my brother immediately decided to come with me. Also a number of my friends showed interest for being in the support crew, too. Suna was always very interested from the first day. As the race day approached we were lucky to have Alessia with us, too. I knew them well enough that I had no doubt in my mind that they were the right people for this demanding assignment. 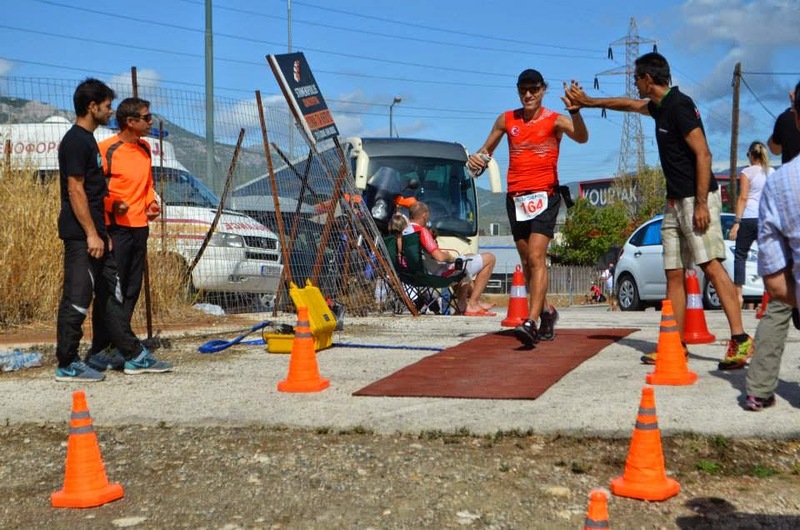 Suna has written a great article about crewing for Spartathlon from the eyes of a support crew member which you can find here in English. Like she said in that article, it's extremely critical to have a mutual trust between the runner and the support crew. Because any doubt may have a snowball effect and result in undesirable consequences. Alessia and Suna. When you put the support car stickers to your car, every door is opened. I didn't have to say anything about the importance of this race. They had done more than enough research to know this race's importance in the ultramarathon world. Thus, I sent them an email before the race explaining my expectations. We did some brainstorming sessions before the race in which I shared my time goals for different sections and told them what I thought I'd need at what point and so on. We talked about different scenarios and how we would handle them. All of those sessions made the mutual trust even stronger. They believed in me as much as I believed in them. So we were ready. 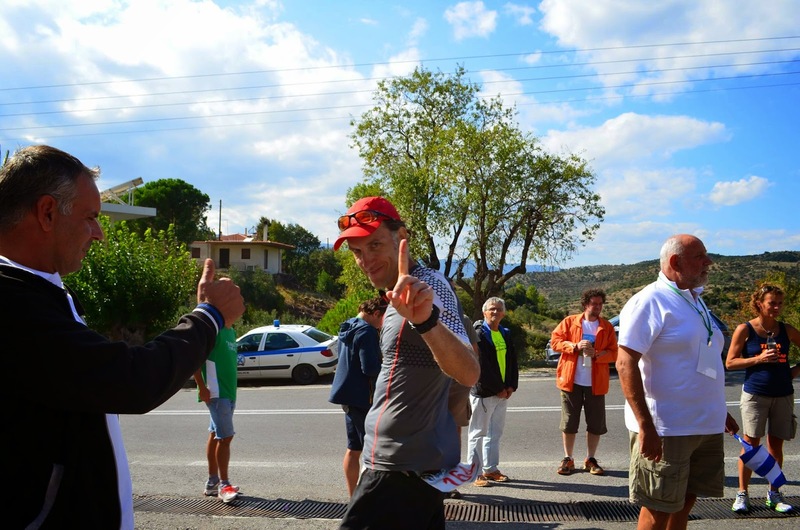 And you can be sure that being a Spartathlon crew member is a very demanding job that requires utmost responsibility, seriousness and devotion. 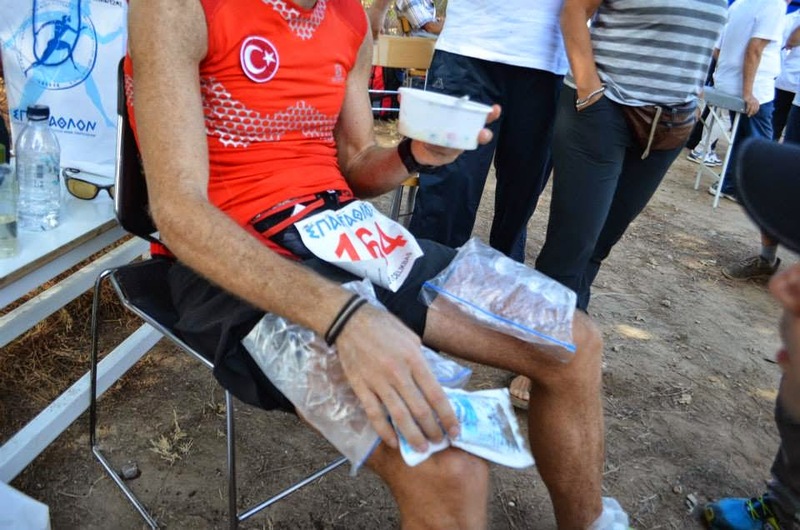 75 stocked aid stations through the 246K course with logistical and medical support. Free accommodation in Athens and Sparta for 6 days. Breakfast, lunch and dinner in these hotels for 6 days. Transfer from the hotel to Acropolis for the race start. Transfer from Sparta to Athens after the race. Awards Ceremony in Sparta on Saturday night. . Lunch with Mayor of Sparta on Sunday at a beautiful location. Official awards ceremony in Athens at a beautiful location and all-you-can-eat-buffet. Two race T-Shirts One for every participant, one for the finishers. Two medals, one regular size, one like a belt buckle. And of course participation to the world's greatest road ultra. 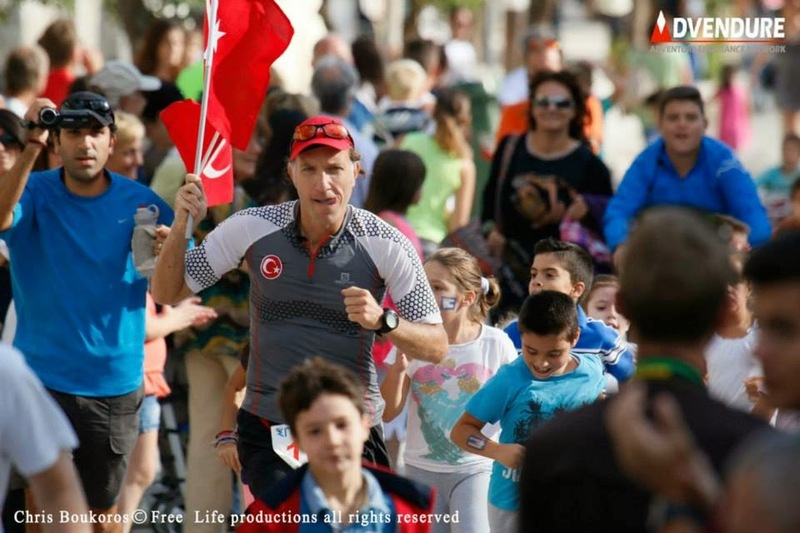 All the runners are placed at six Glyfada hotels which are very close to each other and located about 20kms south of Athens. This way all the runners are kept together which in turn creates a family atmosphere. Plus, you get a chance to breathe the same air with some of the most experienced ultrarunners on the planet. I'm trying to pack before the trip. That's just the tip of the iceberg. . The race was scheduled to start at 7am on Friday. After arriving at my hotel on Wednesday, I took advantage of the free lunch for Spartathlon runners and headed out for the registration. Everything was smooth and I was done in a few minutes. There was also a University research team looking for volunteers to study the effects of this race on the human body. You were asked to provide two small blood samples before and after the race. It was an interesting one and I became a volunteer. I spent the rest of the day with chatting other runners and performing my final mental exercises in a relaxed environment. It's really not possible to list the achievements of the people I've met there. 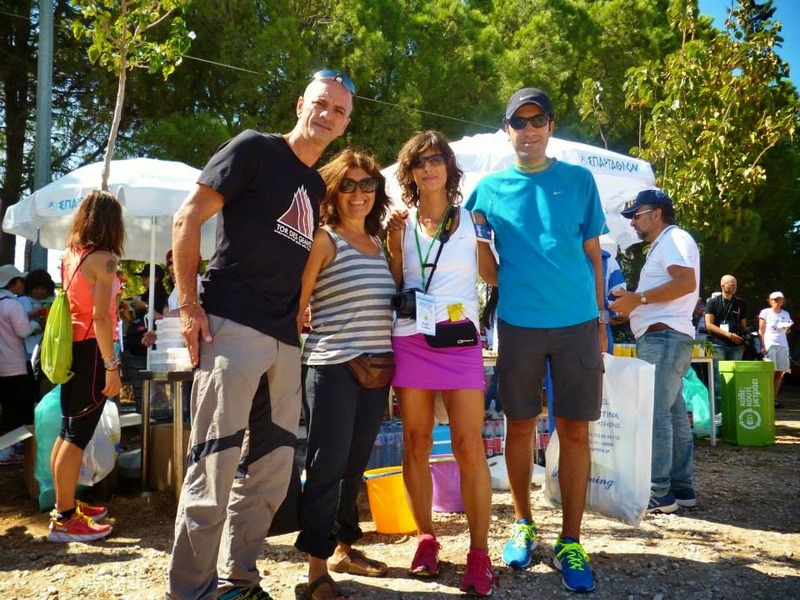 Spartathlon attracts the best of the best road ultrarunners. Think of the hardest races you know of. The standard participant has completed a few of each of those and plus probably some 24-48-72 hour races thrown in the mix. And I'm not even talking about the legends who ran this race 20+ plus times with 10+ finishes. I was a first time participant but all the people I have talked to was really down-to-earth and encouraging. But at the same time they reminded me that this race is always tough every time for everybody. It was the reason they came here year after year and touching the statue of Leonidas gave them an immense satisfaction no matter how many times they did it previously. I couldn't even be considered in the same ballpark with these guys but it didn't negatively affect my confidence. On the contrary, I was encouraged to reach to this level. I knew very well that this was going to be the hardest thing I've ever done. 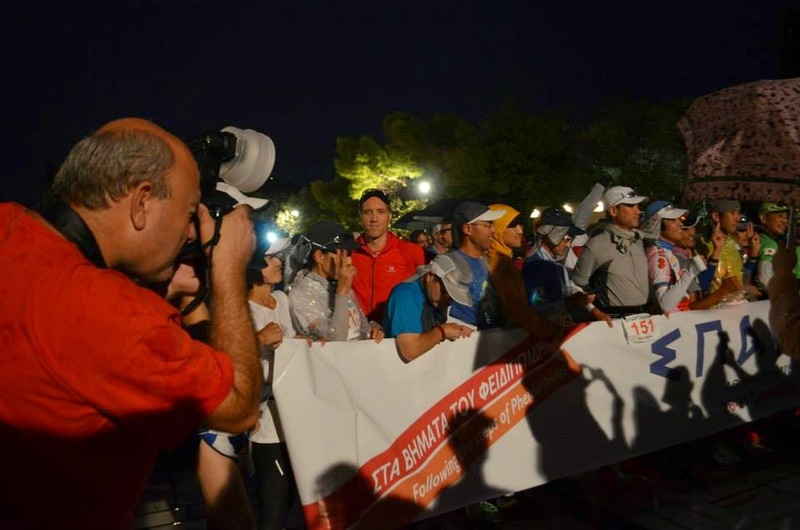 But I've been reading about Spartathlon for years and I truly believed that I had done my work to get ready for this race, And I believed 100% that it would get me to the finish line. The crew arrived on Thursday and we had breakfast together. Then we went over every little detail so that there was no misunderstandings. At this stage our Greek friends Pavlos and Dimitris, who had very good course knowledge and previous crewing experience, really helped us a lot with great tips and encouragement. Even the great Greek ultrarunner Marios Fournaris who was about to start his 24th Spartathlon sent me his cell phone number through Suna in case I had some last minute questions. I have to admit that I thought "what can I ask to someone who ran this race 23 times?" Nikolaos who was going to be volunteering at the 148K checkpoint contacted me through Facebook and told me he'd be happy to assist if I needed anything. Papadimitriou Kostis showed me great interest right from the start and helped me with everything. The crew also said they got special attention throughout the race. So, we were definitely in great hands throughout our journey in Greece. Thursday afternoon was the time for the briefing session. After that we returned to the hotel and I got into bed around 9:30pm. Breakfast was at 5am and the buses would pick us up at 6am for the transfer to Acropolis. It wasn't more than 3 hours that I truly slept but I didn't care. That's the way with me in most big races. I don't believe it's because of the excitement, I think my brain wants to process all of the small details to make sure everything's OK. In any case, that was that and it wasn't a big concern for me in the morning. I shared my time goals with my crew up to a certain point. I expected the first marathon to be done in 3:45-4:00 and 80K in 7:55-8:15. I told them where I plan to get the headlamp, where to put on the night clothes and so on. The more experienced runners choose to go a little bit more slowly in the first 80K and try to maintain that speed until the last 50K or so, if not further. But in order to do that you have to have experience on tarmac and in this kind of distance. This was my first Spartathlon with no long pavement experience so I thought I'd slow more because my legs would be trashed in the last sections. Thus, my strategy was to build some cushion in the first half and then hold on to that until the end of the race. I know it's risky but when you run this race the first time everything's risky! And I believe you have to be confident enough to apply your own strategy rather than someone else's. 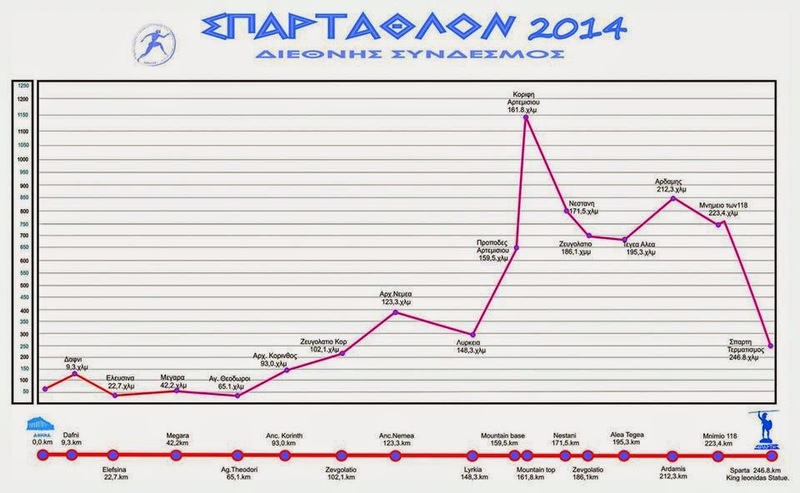 The reason Spartathlon is legendary is not because of its 246K distance. It's the strict individual cut-offs like no other race. I was talking to a Japanese group after the race and they told me they also have the 250km long Sakura Michi ultra for more than 20 years. And they told me that a lot of Japanese runners who "comfortably" finish that race can't even reach further than the mountain in Spartathlon. Before coming to Athens, I had a meeting with my friend Ilgaz who has lots of experience with creating elevation profiles. Although I think we should call this a "cut-off profile" because unlike other races they were the things I was most concerned about! We thought including 75 points would be hard to follow so we decided to create one with 14 points where I would see my crew. One of them started from the beginning, the other started at Corinth 80K. I took the one that started at Corinth 80K. 75 boxes for 75 checkpoints. For dropbags. 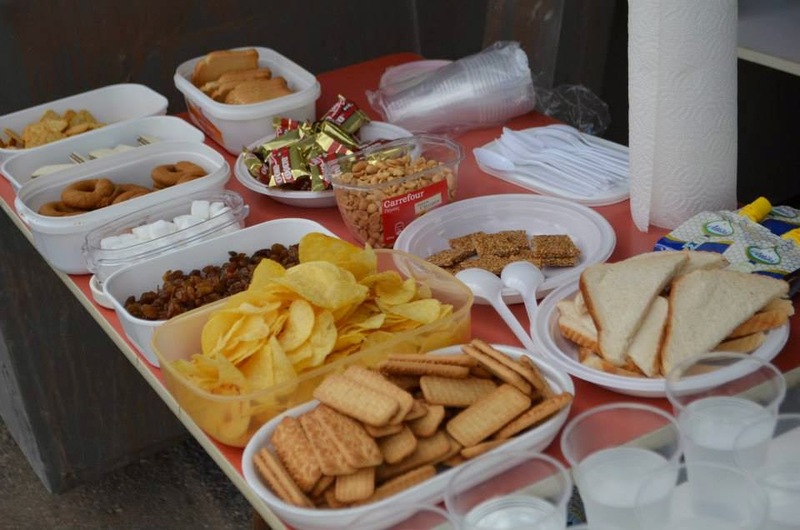 A standart aid station table. I get up around 04:30 on Friday morning. Breakfast, last minute tasks and I'm sitting inside the bus at 6am. It'll be a 20-25 minute trip to Acropolis. A French runner sits beside me and tells me that he was pulled out from last year's race at the 223K point because his legs were locked up and he just couldn't take a step. Everybody is joyful in the bus and that reminds me of the animals taken to a slaughterhouse, unaware of their fate. Of course, most of them ran this race previously so they know what will happen. I am the one who's about to be slaughtered but still it's quite amusing. At the start line, it's the same relaxed atmosphere as if we are about to start a Sunday morning group run. It's overcast with a light drizzle. My crew wish me luck and I take my place at the starting line. I close my eyes for a few seconds and once again remind myself that I'm about to start my dream race. I had been training my body and mind for the last 7 months for this race and know I'd do everything in my power to get to the finish line. My last minutes are very peaceful and relaxed in a strange way. And it starts. At precisely 07:00 about 380 runners head out from the foot of the Acropolis to the city of Sparta which is 246kms away to deliver the message to King Leonidas. 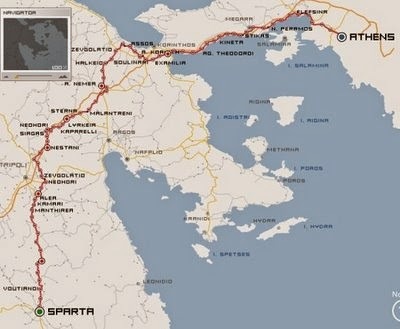 The route has ~3500meters of climbing and we have to reach Sparta in less than 36 hours. 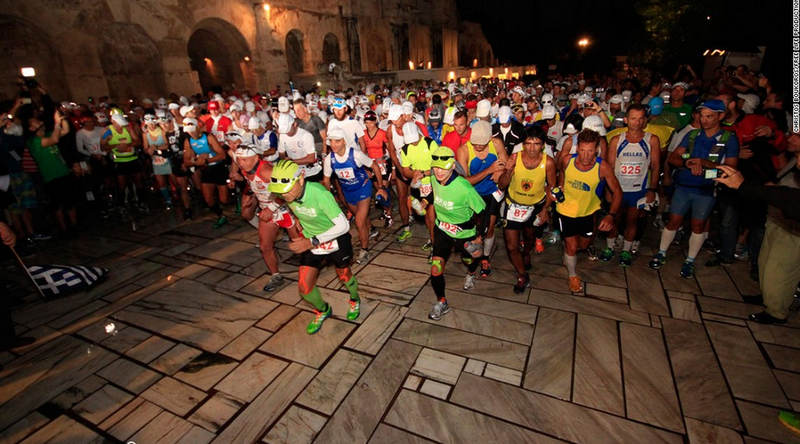 The first 2 kilometers are downhill on cobblestones and then mostly flat on the streets of Athens. Since it's Friday, everyone is trying to get to work. People waiting at bus stops provide encouragement. After a while I see a runner coming towards us from the opposite direction. Why is he running backwards? Then I notice he has no bib number and he's just out for a morning jog. He salutes us and goes on his way. The absurdity of this incident makes me laugh. After the race a lot of people would say the first 30kms were not very fun since you ran in the suburbs of the city. But having trained on the streets of Istanbul for so many months it's a luxury for me to run on a course with mostly respectful drivers where the police do their job properly. Plus, it's all new to me so I don't have complaints. At the 10K point we cross a highway intersection and cars are queued for almost 1km but no one is blowing their horn. This race is really special for the people of Greece. I had a small calf injury 1.5 months before the race so I did a more aggressive taper in the last 3 weeks. After months of high mileage my body is well-rested and the first kilometers go very quickly. I'm at the half marathon point in the blink of an eye. We pass a school and there are students lined up on the street to greet the runners. I think to myself that these children are living this experience for 32 years, at least for two generations. I wonder how this race changes their outlook on life and broadens their horizons. We're lucky that the weather is cloudy. At one point we face some headwind but I did part of my training in Cesme which is a very windy town so I don't even notice. I'll see my crew at the end of the first marathon in Mecara. It was mostly flat with no major climbs. I pass the timing mat at 3:45, just as I predicted. Approaching the aid station I think of the past. I had started running exactly five years ago and decided to run a marathon 2.5 months later. At that time I was able to finish it in 4:24 and there was no way I could have run any more. Now I'm here to attempt this five more times while going up and down a mountain in the greatest ultramarathon in the world. To be able to train my body and mind to attempt this gives me motivation and strength. After running for another 2-3K, it starts to rain really hard. 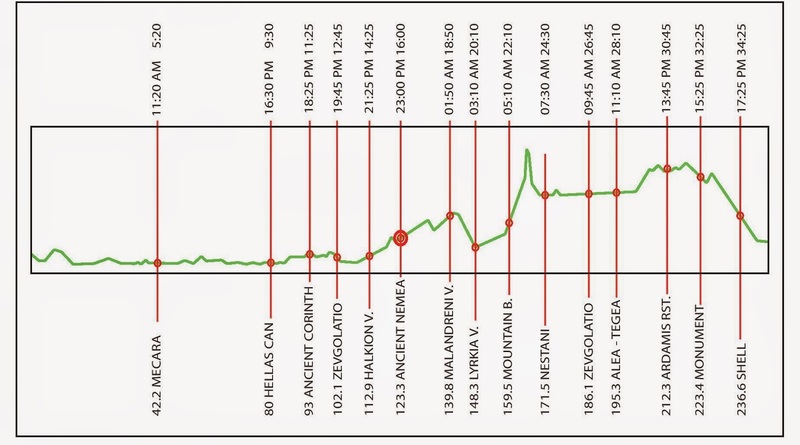 The first major climb is here which is about 1km long. Towards the 55K point we pass undulating roads where we have the sea on our left. There are some hilly sections in this second marathon and I don't feel good in parts of this section. The first excitement is over, legs start to feel the distance and your brain is bringing up the negatives. There are whispers in my head that reminds me I "only" have 200kms to go. I respond to them by saying I'm going to feel better later and try to silence them. In that section a phrase comes to my mind which I would later repeat over and over until the end of the race. "You're running the Spartathlon. What were you expecting?" I repeat this in my head for a number of times and my brain fails to find a proper response. Yes, what was I expecting? To run this race without any problems? Really? It makes me happy that I find a new weapon against my brain when things would get tougher. And I know it would get tougher. Much tougher. After having a difficult 10k or so, things start to get better again after the 65K mark. Now, I'm focused on the Corinth 80K checkpoint where the cut-off is 9:30 hours. The sun is up but I had trained in hot environments through the summer so I don't feel it yet. Corinth is a critical aid station. Every year a number of people stop here. Not because they are unable to go on but because knowing that they just ran a relatively fast 80K and that they still have another 165K to go with very strict cut-offs. That's not an easy weight to shoulder especially if you have some problems in the first 80K and you're not feeling good. We have created two different profiles before the race and one of them started at the 80K mark. I took that one with me because I wanted to dictate to my brain that the first 80k was just a warm-up and the race would really start at that point. So, I pass the Isthmos bridge and arrive at Corinth in 7:45. 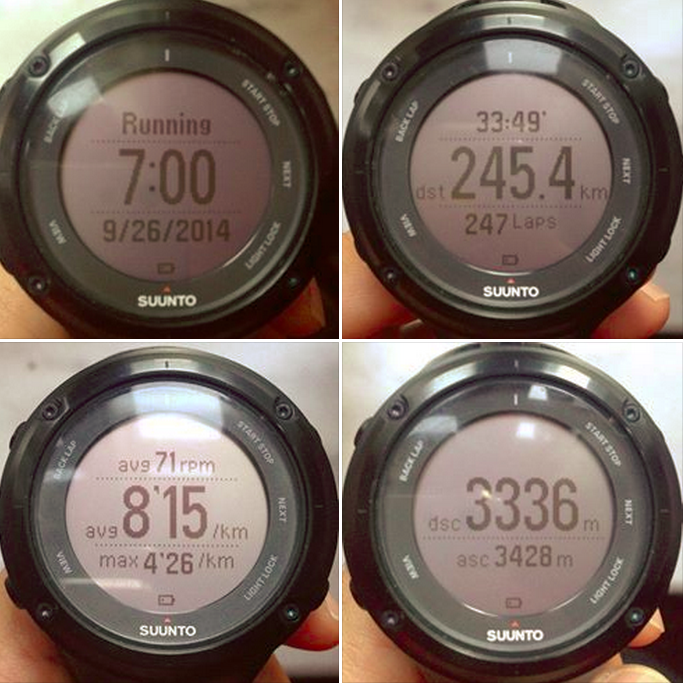 My Suunto Ambit 2 tells me the first 80k had about +800m climb. I'm a little bit faster than the schedule but the weather was cool in the first hours and I feel fine. I eat some rice and it feels nice to have some real food after this time. My crew is providing me great energy. I also ice my quads as they are getting really stiff. To digest the big meal I switch to fast walking and jogging in the first few kilometers after the station. I tell myself that now that the warm-up is over, I need to focus even more. When I start to walk I look at my instant pace and try to keep it at 8:30min/km. We did some negotiations with my brain before the race and came to an agreement that it'd never be over 9:00min/km when walking unless it's really hilly. I have about a 1.5 hour cushion over the cut-offs and I know I need to keep it until the end of the race as it's so easy to lose it when you have a problem. 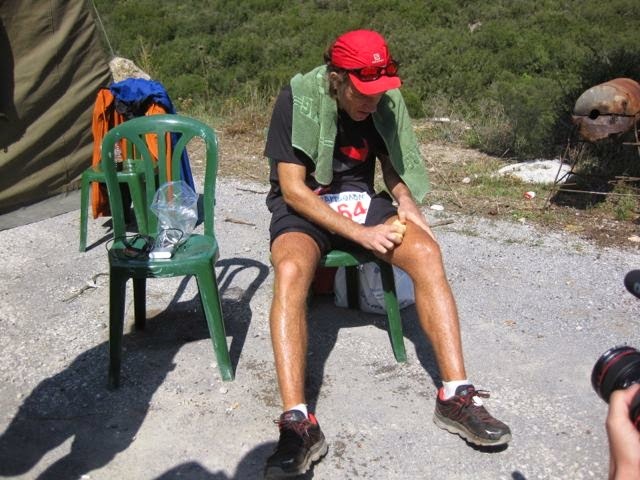 Now it gets quite hot and I take salt tablets, eat chips and drink Isostar at aid stations. When I approach 95K point I sense a problem. Even though I know I drink enough my skin gets extremely dry and I have trouble running. I understand that I was getting too much salt as I was drinking lots of Isostar just because it tasted good. I remind myself to only drink water for a few hours. As I approach the aid station there are children waiting for us with notebooks and pens to get our autographs. I stop and give them a few and they are so happy that you'd think we were some kind of rock star. This race means so much to the people, you have to see it to believe it. At the station Alessia also reminds me to constantly drink water. I do that for 1.5 hours and pee for 3-4 times. As I get rid of the excess salt, I start to feel much better again. It was a stupid mistake and I make sure not to do it again. 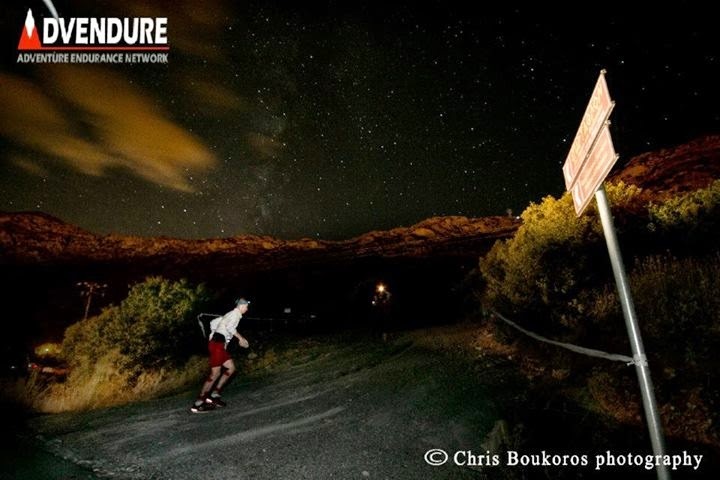 At about 19:40 and around 115K it gets dark and we begin the night stage which would last more than 11 hours. I'm constantly glancing at my Ambit 2 since from the start and doing endless calculations to determine my position in relation to the cut-offs. I have forbidden myself to run slower than 6:30min/km pace when running and 8:45 when walking. I modify them a little bit depending on the grade. But I can't relax even for just a second, the calculations keep going on in my head. I like to run at night. Focusing on the beam makes you forget other things. With night comes the silence. And with silence comes the feeling of loneliness. We run on tarmac roads through the villages and the only thing that breaks the silence other than the support cars is the barking of the dogs. I have endured quite well up until this point but not having any music starts to really bother me. (Listening to music is prohibited in Spartathlon). In the last few hours, I was searching for songs to sing in my head but I can't think of any. I'm someone who always run with music when I run alone so how can this be possible? After the race I talked with some English runners and they told me the same thing. One of them said he was begging to his crew to tell him a few songs. This is an interesting phenomenon but I guess there's an explanation because it's similar to one of my favorite real life survival stories, Touching the Void. In that, Joe Simpson was breaking his leg while climbing in the Peru mountains and he was unable to think of any song other than a Boney M one for days. The only song I can think of is I Want to Break Free from Queen. Queen is definitely one of my favorite bands and it's a good song but I have a lot of other songs which I like more. Why this song? I have no idea. Is it something with the lyrics? the uplifting melody? Who knows. But it works. I sing it over and over in my head. I pass Nemea (124K) which is the half way mark at 13:42. This was the "easy' half with about +1200m climb. 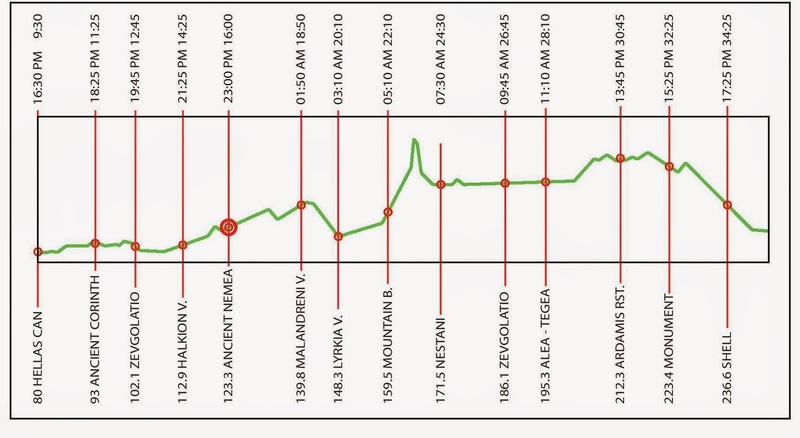 The second half will have +2300m climb. I'm still a bit faster than schedule but I won't complain and I'm relatively good. I sense that my feet are blistered badly and there's some expected fatigue. My stomach and guts complain from time to time as I didn't eat real food for a long time. My biggest problem is not being able to drink soup. In some races, I only drink soup for nutrition but here for some reason my stomach doesn't accept the soup that's on offer. And the other stuff is getting more and more offensive. gets down to double digits. By the way, the distances on these signs are true to the meter. If it says 4.2k to the next station, it's not 4.0k or 4.4k, it's exactly 4.2K. That's 32 years of experience for you. Here I force myself to drink a large amount of soup even though I don't like it. From now on, we have a climb on tarmac until the Mountain Base and then there will be the mountain itself. After leaving the station I pass someone. She yells from the back, "Hey! Do you speak English? ", I say "yes". She tells me she wants to go with someone and talk a little bit. We start to chat while we keep moving as fast as possible. I learn that she's Wilma Dierx who finished last year's race 4th among the women. She's also a member of Dutch ultrarunning team and ran 224K in 24 hours. She has many other big accomplishments. At one time I say to her that "I guess we can relax a little bit when we are over the mountain, right?" but she responds by saying that last year she could only be able to run the last 50K in 7 hours. She warns me that it's by no means easy after the mountain. We go together until 155k and I feel we are working really good. I had no plans to run this race with anyone but talking to someone makes me forget the lack of music. Plus, she has the course knowledge and we have similar pace. I'm happy to find her. We have about a 5km climb to the Mountain Base station on tarmac. Wilma is one of the fastest hikers I've ever seen. I haven't eaten a lot of gels in this race in order not to upset my stomach but now I feel like I need to take one to keep up with Wilma. As I put it in my mouth, I immediately throw up. In the next 45 seconds I throw up three more times. This is my first time throwing up in an ultra. Wilma waits for me during this episode and jokes that "Now we are real friends!". I apologize for the 1.5 minute delay and we start power hiking the hill. She tells me to wait for 15 minutes for my stomach to settle but then make sure to eat something or I won't have any energy. My stomach got a reset and now my biggest trouble is my guts which is bothering me for the last 4-5 hours. We reach the Mountain Base (160K - 100 miles) in 19:5x. Before the race I thought that if I manage to reach here under 20 hours, my chances would be good. I congratulate myself but to tell you the truth I'm in pretty bad shape. My stomach is fine but I'm very low on energy. I need to eat a proper meal. My feet are blistered really bad. My quads are killing me at each step. When we enter the station, I tell Wilma that I'd need 15-20 minutes to gather myself. She says that's not possible and that we need to leave in 5-6 minutes at most and climb the mountain together. Unfortunately there's no real food at this station. I decide to change socks but I don't want to see my feet. Even though I had taped them and this has worked quite well in other races, this time the socks come with the skin. I think the rain at the beginning of the race has something to do with that. We pop out a few blood blisters with the help of Suna and tape them again. It's getting really cold and I put on some warm clothes. Wilma calls me to leave together but I say that it's not possible as I'm yet to eat something. So she does what she needs to do and leaves alone. After putting on the clothes there's something else I need to deal with and that's to empty my guts. I don't know if you've ever tried to squat after going hard for 160K on tarmac but I can guarantee you that it's not the easiest thing in the world. I go to a proper spot by the road but I just can't squat. My brother comes to the rescue and somehow, someway we find a way and manage to get the job done. After all these chores, I'm finally ready to leave. Up until now my cushion over the cut-offs was always 1.5-2 hours. Don't ask me how it happens but while trying to sort out this issues it comes down to just 1 hour. For more than 18 hours, I almost ran the perfect race for my standards but with the problems I face in the last 1.5 hours I'm about to lose all that advantage and get into the danger zone. This is the truth of Spartathlon. It's what separates this race from all others. When I leave my crew, they don't show me any negative emotion but after the race they will all tell me that at that station I was looking really, really bad and they had serious concerns about the rest of the race. As I start the mountain climb, I'm well aware of the fact that this next part to Nestani (172K) will be the make or break section in the race. Another mistake or another bad patch in this section would mean that I'd lose the remaining advantage. And that would virtually be the end of my race. Before the race, I visualized hundreds of scenarios and ways to overcome the problems I would face. Now it's time to see whether I can apply these to a real life situation or not. I keep saying to myself that "it can't get much worse than this". I got my electrolyte balance screwed up, my quads are like cement, I threw up for the first time, my feet are trashed, my gut is problematic. OK, I can maybe drop off the mountain or get hit by a truck but I think that's it. These thoughts give me a glimmer of hope but it's still quite hard to ignite them. Let's make one thing clear. This is not a Hollywood movie in which you think of something and then magically start to run as if you are reborn. It doesn't work like that in real life. Sometimes nothing seems to work but you still need to hold on to the tiniest positives you can find. And if you can show the determination, strength and courage to continue, there's a chance that things may start to get better, even though it can happen very slowly. I look ahead...A steep and technical climb. It's not something I would run even when I'm fresh let alone after 160K on my legs. But I notice that I can power hike quite fast. I haven't seen this climb before but in the previous months I climbed it hundreds of times in my head. After a while I pass someone. Then I lock on to the other headlamp ahead. After a while I catch him, too. Then the other. I'm now in race mode. this way I reach the top in the blink of an eye. I don't know, maybe it's because I've convinced myself that it was going to be much harder but for me this climb seems quite short. The top is very windy. I drink some coke and head down quickly. The terrain is quite slippery and there are loose rocks all around. My quads are screaming but I'm not in the mood for listening. I start running. Nobody around me runs this downhill except for me. I see lots of headlamps below and catch them one by one. I'm now back on tarmac and I keep the momentum going by running almost all the way to Nestani. As I approach the station I'm thinking that my crew would be really surprised to see me this early. When I get close to the station, a woman runs after me and says that I'm in the wrong way. I turn back and see my mistake. I thank her three times and take the right way. As expected the crew is really surprised to see me this early and energized. I managed to get the cushion again into 1 hour 45 minutes or so. But I spent lots of energy and I know I need to eat well here and gather myself. After leaving the CP, I decide to walk at 8:30 pace for 2km's to digest the food. I don't want to throw up again. Then I turn into a walk run mode. And I run all of the next 5-6K until the 183K checkpoint, During this section it gets light and I catch and pass Wilma. It would have been good to run together but I need to keep the momentum going when I have the chance. In this regard, Spartathlon is quite merciless. If you want to finish, you have to run your own race. This is the last time I see her. I will later learn that she finishes in 34:47. At the 183K Checkpoint I maintain my 1:45 cushion over the cut-offs. Now it may sound good to you but I need to work extremely hard in every section just to hold on to my advantage. Sometimes I say "there's surely something wrong with these calculations, this thing can't be this hard". Then I say "What were you expectiing, you're running the Spartathlon". I'm making the simplest of calculations 3-4 times just to be sure that I'm not making a mistake. But there's no mistake. This race is something else. I want to break free… Running without the music for so long absolutely kills me. The same song is playing in my head for so many hours. The pace and time calculations are eating me from the inside. The road is mostly flat until 198K with little ups and downs. Of course, those little things are actually don't feel that little with almost 200k on the legs. Then starts the brutal 5km climb. It's not very steep in trail ultra standards but it's not a grade that can be run at this point of the race. But you have to walk it really fast. After climbing for a while I glance at my watch and see the transition from 199.9K to the magical 200K number. I pass the mark in 27 hours and 8 minutes. I remember Wilma saying that she ran the rest of the way in 7 hours when she finished 4th last year. I have less than 9 hours and the fact that I still can't relax bothers me a lot. Despite all my hard work it will still come down to the last second and I get really angry at this ridiculous cut-offs and speed up. 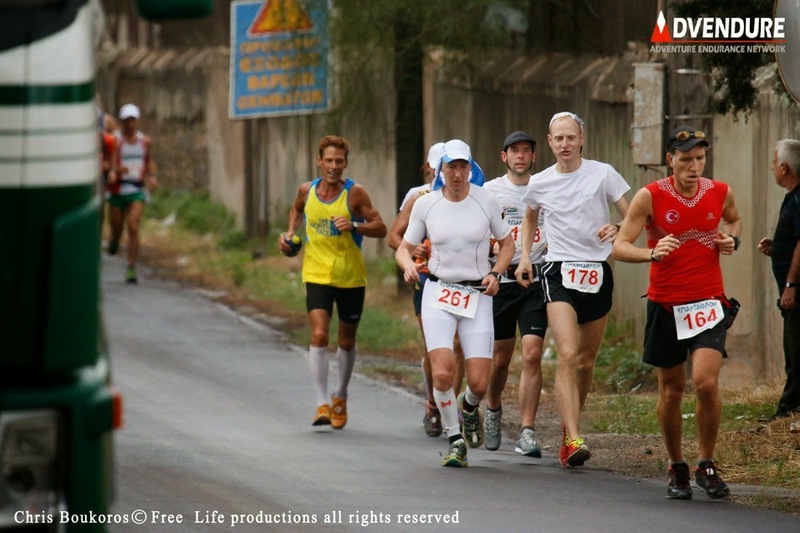 After a while I catch Dean Karnazes in front of me who's running this race on a natural diet and we chat for a while. We were back and forth since the beginning of the race. I tell him that his book was one of the first ultrarunning books I've read. He's really a very nice and down-to-earth person like all the other ultrarunners I know. We go together for some time and then he needs a restroom break. This will be the last time I see him. After the race he'll say that this was the toughest race he has ever raced in. No,I don't throw up here, but I'm exhausted and drowsy. Around 200k it gets hot. Photo Suna Altan. After going alone for 3-4 kilometers, my darkest moments arrive. It's around noon and the sun starts to bite. I feel incredibly drowsy, I can sleep at any moment. Pavlos has warned me that this would happen on the second day but there's nothing I can do. The fact that my body and mind had been working in overdrive for almost 30 hours took its toll. In other races you can relax at some sections but in this one I couldn't do it even just for a minute. We are going on the left side facing the traffic. I start to get really concerned about the cars. Actually, they're mostly driving carefully, it's me that I'm concerned about. I'm literally sleepwalking. I splash water on to my face and neck from my water bottle but it barely helps. I force myself to run because it gets me awake. I would give my everything just to lie down by the side of the road but there's no time for that. And if I stop even for 10 seconds, my legs start to lock up and I need a lot of time to get going again. I fear that at some point they would permanently lock up and I'd be taken out of the race like the French runner I met on the bus. I'm trying to find my way in dark tunnels. They're very dark. I have gone to dark places in previous races but this is nothing like them. 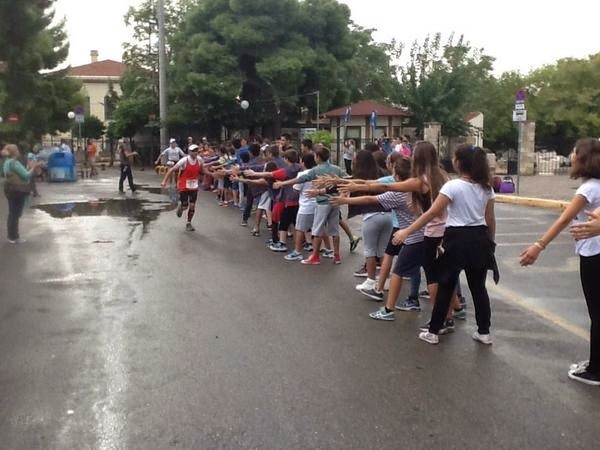 When you start to run the Spartathlon you have two options to end the race. One of them is obviously touching the statue. 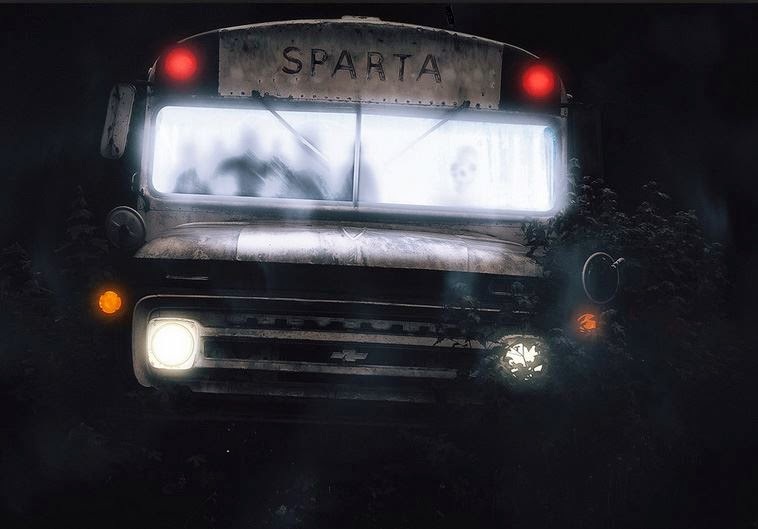 The other is getting on the bus which is infamously called the Death Bus among the Spartathletes. It comes from behind and picks up runners who don't make the cut-offs. I made up my mind before that I would not get on that bus no matter what but the other option still seems so far away, still so very difficult. I make more calculations. I conclude that it would take me somewhere between 35:45 and 36:15 if I walk the rest of the way really, really fast. Then I get really angry. I mean, come on, what kind of race doesn't let you walk the rest of the way after going relatively hard for 210 kilometers? I try to run again so that it would be less stressful in the final hours. I have to be honest both to myself and to you and confess one thing. I don't remember everything clearly in that section. But I remember vividly thinking that "I will finish this race but then I will not write a report or I will not talk about it because I want to forget all these moments and these suffering.". Yes, this is the first time a race makes me think of something like this. I really need music. I am about to get paranoid. Calculations, paces, cut-offs... I think of the sacrifices I'd made for this race in the last 7 months. 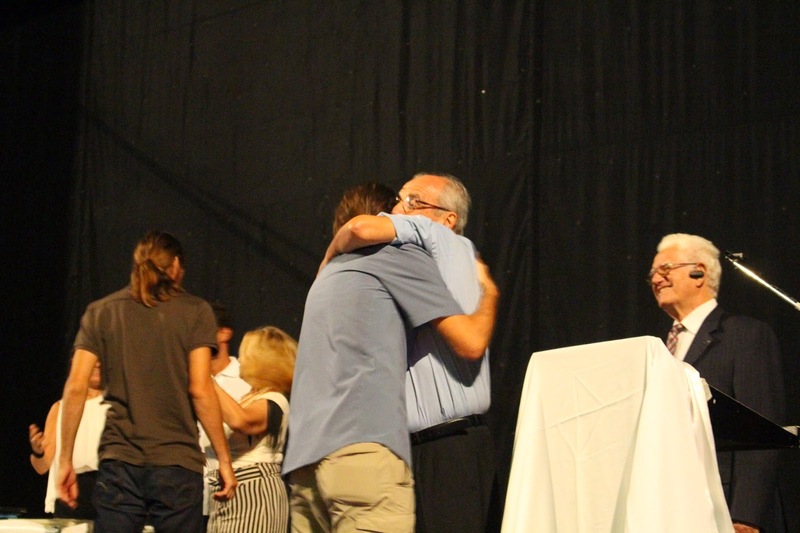 I think of the people who believed in me and come all the way to Greece. I don't know how it happens but somehow I arrive at the 223K station and my crew tell me I'm still about 1:45 over the cut-off. I tell them that I'm not interested in the cut-offs anymore. I have 23K to go and over 5 hours to finish. You'd think it would be so easy but believe me I'm not 100% sure at that moment. I believe I can do it but I still fear my legs locking up at some point. I see Pavlos and Dimitris at various checkpoints. They ask me how I feel and provide tips for the next sections ahead. I'm out of this station high in morale. 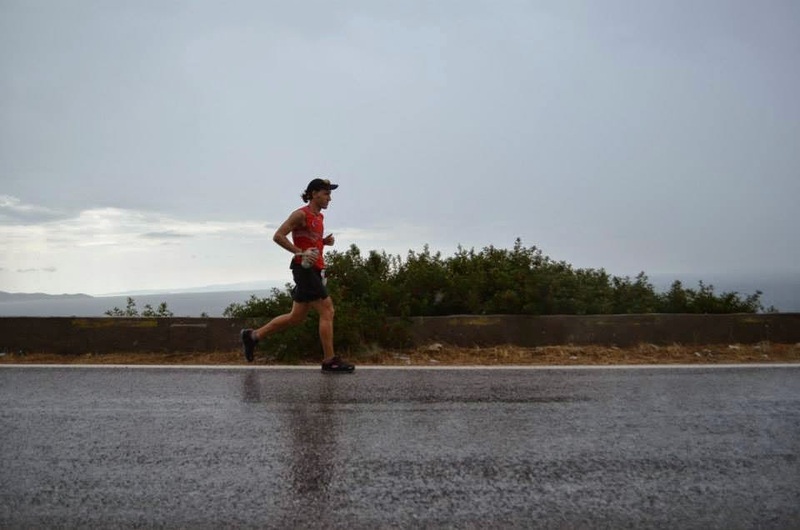 After a while I see the Greek runner who is going to attempt the double Spartathlon. What does it mean you ask. Hold on tight and take a deep breath. It means, he'll run the race, rest a few hours, and then run back to Athens. And on his return trip there would be no aid stations, he'll only be assisted by a car. I think of his attempt and I get embarrassed of myself for whining. I now have some extra motivation to get to the last 10K. By this time, everything slows down to a crawl. I really believe that I must have run for half an hour but when I look at the watch I see that it's been only 750 meters. After a while someone shouts my name from a car. I look at that direction and see my best friend Budak and his family. No, it's not a hallucination. They had arrived in Athens on Friday night and rented a car on Saturday morning to catch my finish in Sparta. I knew he was going to come but we were not sure if they were going to make it on time. I tell him that it's against the rules to go beside the runner and direct him to the next crew access station. The last 20K is mostly downhill. If it was a different race, I'd say it would be perfect. But with 225K tarmac running on the legs, running downhill is so painful that I can't even describe. It's not just me that's suffering. Everybody around me is alternating running and walking at some point. I enter the last 10kms. Up until that point some cars were saluting us with their horns and now almost every car does that. I run almost all the way down till I see the "Sparti 4km" sign. and then the road flattens. The only reason I run is because walking downhill is every bit as painful as running and I want this suffering to end quicker. 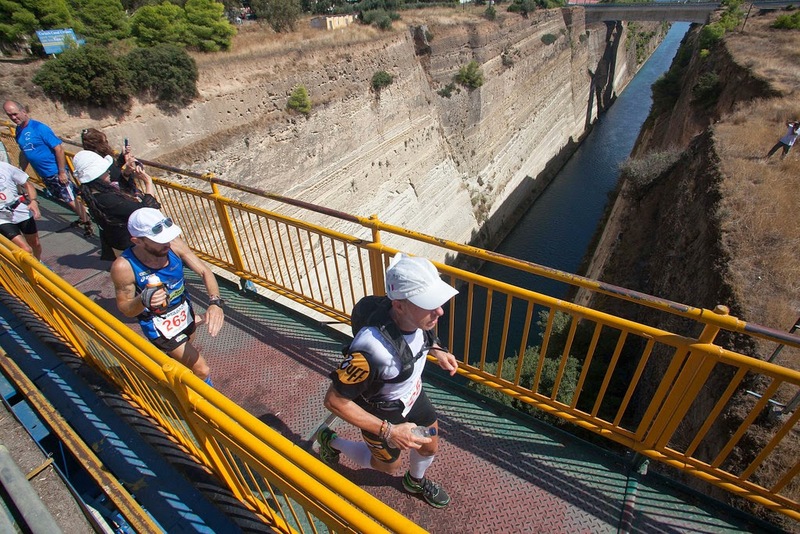 I then run on the bridge over the Evrotas river which Pheidippides drink from. Last 9km to go and finally there's some time for a selfie with Budak and my brother Aytug. The 74th and last checkpoint is 2.4km away from the finish. As I approach the station the volunteers direct me to go straight without stopping if I don't need anything. Well, I don't need anything but I still stop to shake their hands and say thank you. They were all incredibly supportive throughout the race.This race evokes incredible emotions in you. They cheer for me and I head out for the last section. After a while a kid on a bicycle starts to ride in front of me. I am walking fast but then I get embarrassed and start to run a little bit. The kid makes a sign towards me as if saying that "Relax, you don't need to hurry for me, take your time". It's obvious that he's very experienced in this task. Who knows what he had witnessed before. I look at my watch and notice that I would finish under 34 hours. I would have taken 35:50 in an heartbeat before the race but knowing that historically only half of the finishers go under 34 hours makes me feel a little happier. People are cheering from the balconies, cafes and cars. You feel like you're a marathoner who's about to enter the stadium in the Olympics. There's tremendous amount of respect for the participants. I finally take that famous right turn and now I can see the flags and the statue which is about 400 meters ahead. People see me and get on their feet to cheer. I see my brother and my friend Budak in the distance. I get my flag and just like that all the pain and suffering vanishes. I start running as if I had started minutes ago. I can't tell you how many times I ran on that street in the last 7 months and how many times I touched that statue in my head but to do that in real life and after running for 246K.... it's an indescribable feeling. 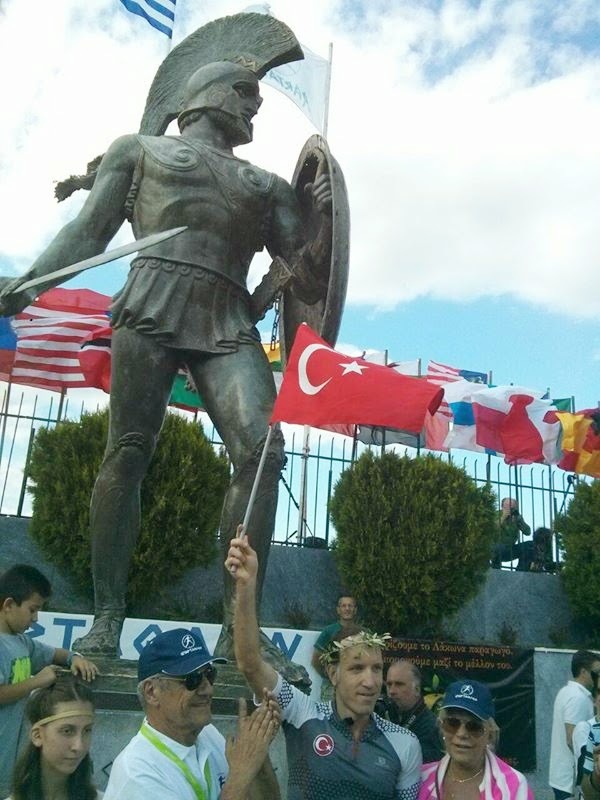 I touch the Statue of King Leonidas in 33 hours, 47 minutes and 57 seconds. I drink my water, wave my flag and hug Papadimitriou. A nurse takes me to the medical check and I can finally stop and relax. Everything seems like a dream. A dream that's so beautiful that it doesn't seem real. After the medical check we returned to our hotel. After a shower and quick dinner we got into our beds as everybody was very tired. The next morning I got up at 6 feeling quite good. At the breakfast we were extremely lucky to meet with Dave Ireland who was a member of the original team in 1982 when John Foden and friends ran the route for the first time. Dave said he ran 80kms of the original course that year and that they would drink beers because there were no electrolyte drinks back then. Then we went to the statue again and took some pictures together. After having a shower. Feels so good to finally lie down. With Dave Ireland - Really lucky to meet with one of the pioneers of this race. 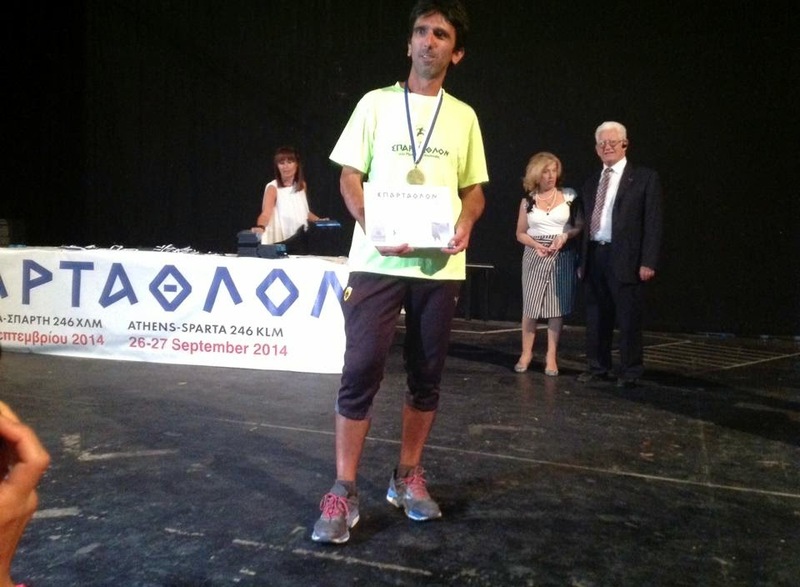 Spartathlon has three different award ceremonies. One of them is on Saturday night but unless you finish at the very front it's hard to attend since you'll be exhausted by that time. The other is the lunch given by the Mayor of Sparta. 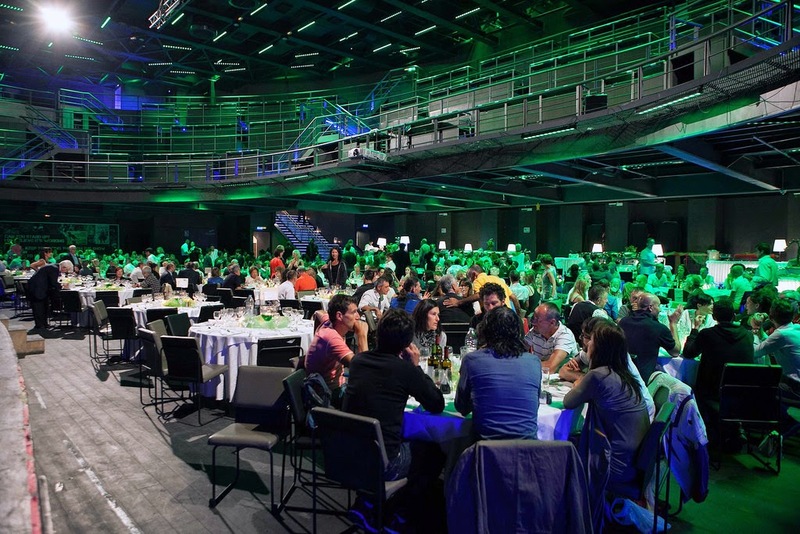 And the last and most important one is the Official Awards Ceremony in Athens which takes place on Monday evening. We attended the lunch on Sunday but had to leave early for Athens as the crew had to fly back to Istanbul that evening. I stayed in Athens as I was going to attend the official ceremony, too. 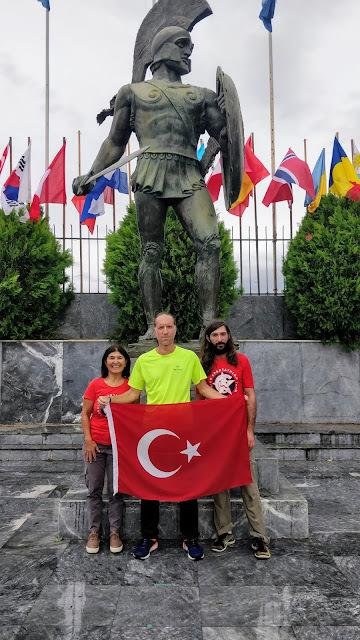 On that lunch my brother Aytug took photos with two Spartathlon legends. Aytuğ, with Hubert Karl who has 18 finishes. Aytug with İvan Cudin, the race winner. The official ceremony takes place in a great location. While you're watching the race moments from the big screen, everybody who manages to finish the race is announced with their names and countries. You go to the stage and receive a second medal, a finisher's certificate and a DVD. After that it's all-you-can-eat-buffet with a very rich variety of food. It's by far the most beautiful awards ceremony I've ever seen. This quote might sound a little bit harsh at first but having seen the race I have to say I won't argue much with the founder of this race. Luck starts by making a proper plan that fits your strengths and weaknesses. It goes on with hitting the streets at 5am regadless of the conditions. And it ends by training not only your body but also your mind and soul. I've been reading about Spartathlon for years but in the last 7 months it was my diet. I ate Spartathlon, I drank Spartathlon. I ran the course hundreds of times in my head even though I haven't seen it before. And just like all the other participants I've made lots of sacrifices but in the end it was all worth it. 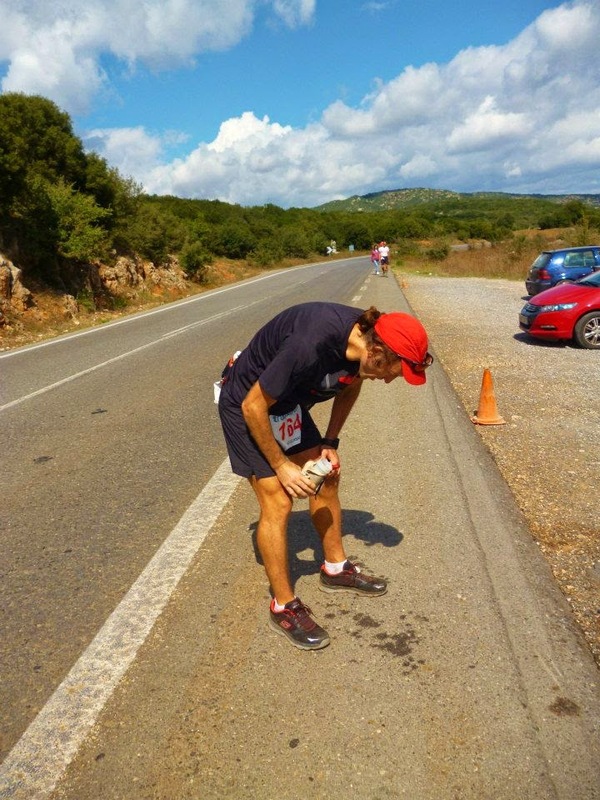 Spartathlon was by far the toughest race I've ever ran. Yes, I finished under 34 hours but don't let it fool you. I had to put on my best performance and keep that going for the entire duration. In the last 7 months, I brought myself into the best shape of my life physically, mentally and emotionally. It was tough not necessarily because of the distance but because of the unrelenting cut-offs. In every race over 10-15 hours you take it easy for some periods and relax. Sometimes you need to sit for 20-30 minutes to recharge your batteries. This is vital to catch a second or third wind at the later stages. Even though I was mostly 1.5-2 hours ahead of the cut-offs in the race, I was never able to relax because I knew that I could have lost it just like that if I had a bad patch. (and it was almost happening at the Mountain). I could only relax a little in the last 9kms. After the race I dozed off for 5 hours and then I woke up numerous times still making calculations in my head. I then realized the race was over and took a deep breath. The best case scenario before the race was getting under 34 hours. It wasn't a goal. Like I said, I'd have taken 35:50 in a heartbeat. But experienced Spartathletes told me it's not easy to do it in the first try so I'm happy about it. I really had some dark moments in this race like never before. I had to dig deep into my soul to find strength, determination and courage. This race takes no prisoners and it forced me to my absolute limit. I hope that it would make me stronger and more determined in my future challenges, both in running and in life. I have to confess that running without music for so long absolutely killed me. I don't think there's a lot I can do about it. I don't want to do it in training because for me the training should be fun. If it becomes a chore I don't think I would do it. What would I do differently if I participate again? -I saw that I need to strengthen my quads for a race like this. 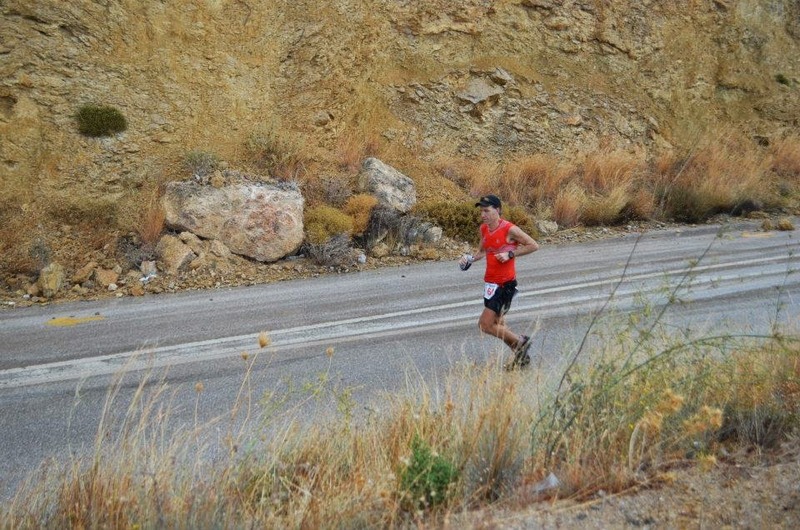 I like running downhill and I was able to run downhill at the end of other ultra races. That's why I thought I would somehow be able to run in this race, too. I ran parts of the last section but it was the most difficult thing I've ever done. The pavement is unforgiving. I'd think of doing long downhill repeats on pavement. -I'd try to have a better nutrition strategy. I needed to see what's being offered at CPs and how my stomach handles them. I could not drink the soup and it really had a negative effect on me. Now that I know these stuff, I can think of a better strategy. -I'd print out the lyrics of my favorite songs and put into the dropbags at various stations. I really wouldn't want to sing the same song in my head for over 30 hours. I think that's about it. Not much else. That tells me that my preparation period was mostly OK for my needs. 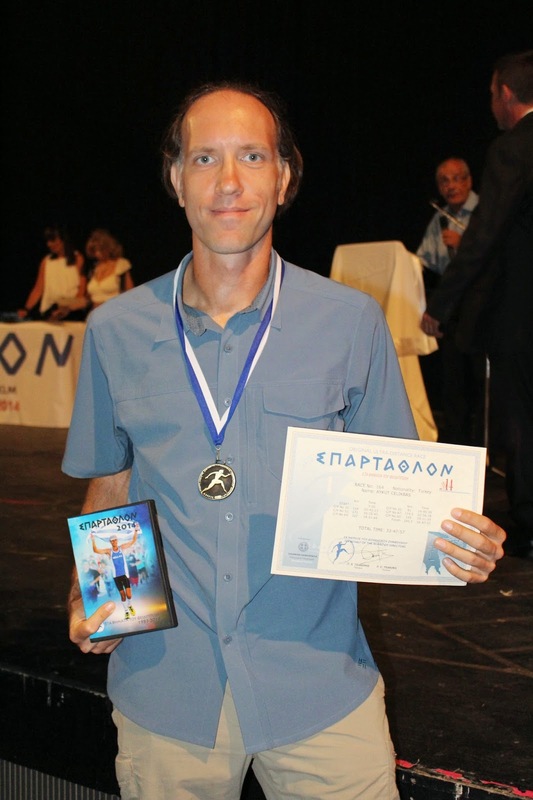 Running the Spartathlon was my dream for years. Sometimes when you want something so bad for so long, you get disappointed when you achieve it because it doesn't live up to your expectations. For me it was the opposite. It exceeded my expectation with its history, culture, participant profile and family atmosphere. And it was every bit as tough as I imagined. Even more. I believe every person has a race that he/she can identify himself. 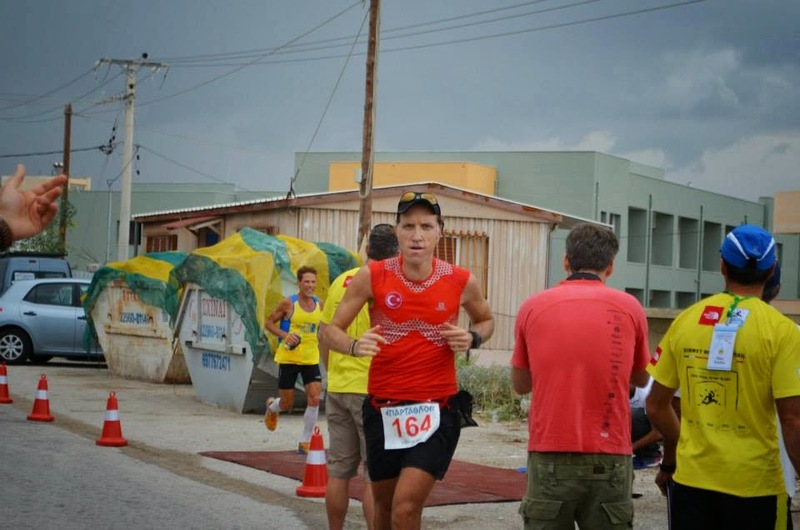 Among all the races I've participated it was without a doubt Spartathlon. I know I have only participated once and I hope this doesn't sound disrespectful to those who ran this race for 20+ times and finished 10+ times, but I feel that I am part of the Spartathlon family. Because everybody I met in Greece embraced us and made me feel that way. I've always thought that running different races was better because there are so many races in the world and so little time and resources. But for me, Spartathlon was so beautiful and special. And like I said after the race, I would run this race every year if it wasn't this hard. Of course, this is not quite true because the reason all the greatest ultrarunners come to this race year after year is because of its toughness. And if it was easy I, too, wouldn't have run it in the first place. The thing is in order to run this race you have to be at top shape both physically and mentally. Otherwise it would chew you and spit out every time. There are some races you run and just forget. There are some races you run and remember for a long time. And there are others that you run and they change you to your core. The latter is very rare. I can feel that Spartathlon changed me. It really did. And I'm really proud to be a Spartathlon finisher. I will dedicate this race to my mother and father who taught me the importance of being honest, showed me what true sacrifice is and told me that I can achieve anything if I you work hard and truly believe in it. This is the only race that I know of that deserves their impact on me. My father is not with us since 2010 but I wrote a note on my arm and felt his presence all the way to the end. I want to thank my support crew with all my heart. They made sacrifices to come here and worked extremely hard for me. It's a really demanding job. But most importantly they believed in me in a race with a 40% finishing rate (which I assume is quite a bit lower for first time participants). The good thing is they told me this was a life changing experience that they'll never forget. They're already thinking about what they could do differently for the next one. My best friend Budak... He took his family and came all the way to Sparta just to see my finish. Who does that? Only a real friend. What can I say other than I'm extremely lucky to have you as my friend. Pavlos, Dimitris, Nikolaos, Maria and of course Papadimitriou. They didn't know anything about me before but they tried to help me whenever they saw me before or during the race. I consider all of you great friends. Thank you for everything. Just know that you have a friend in Istanbul. The people of Greece and Sparta who supported us throughout the whole way as if we were very important people and cheered for us endlessly in the most beautiful finish in the ultra world. My friends who followed my race online and supported me with encouraging messages. 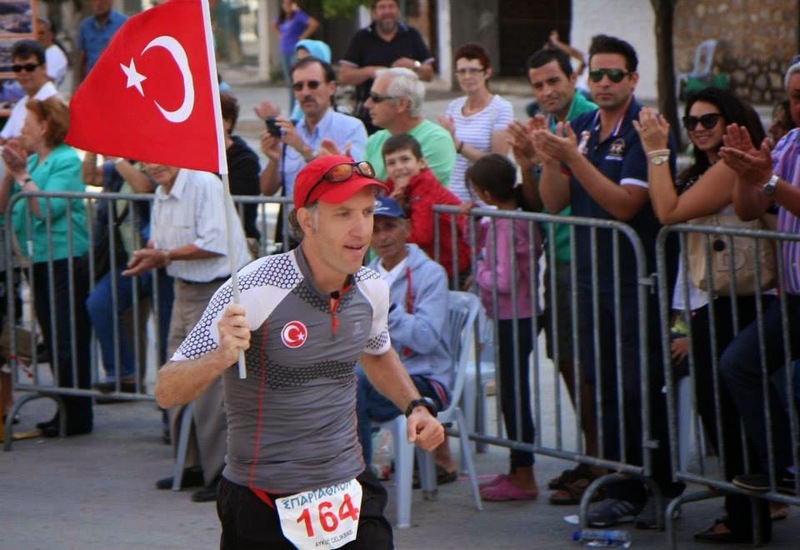 The small but tight Turkish ultraruning community. It was George Zahariadis who I saw at the end of the race. He finished his race, rested a few hours, then started running back to Athens. 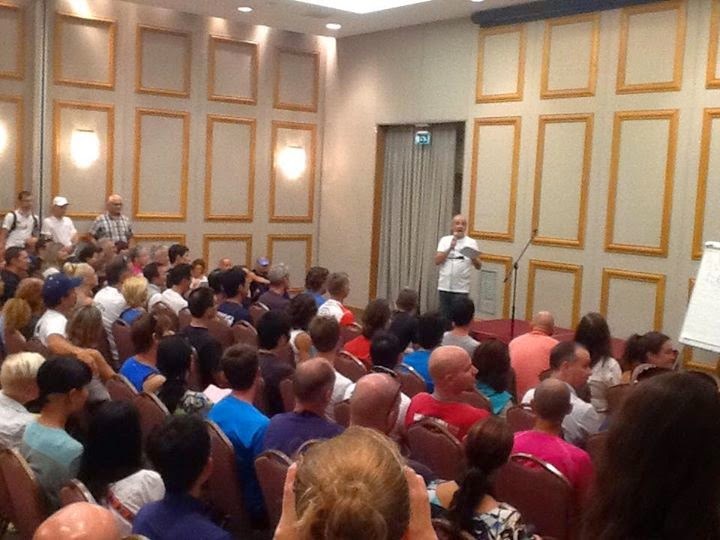 And here he was at the start of the official ceremony after his 86 hour/500km run. This is the human spirit. Congratulations Aykut. 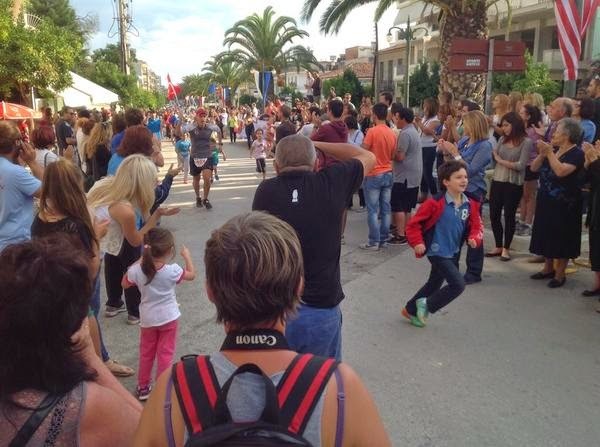 Fantastic result on your first Spartathlon and extremely well written report. En içten duygularla kutlarım! Hem koşu hem de paylaşımların çok etkileyici ve ön açıcı. Aykut, I have read this four or five times. 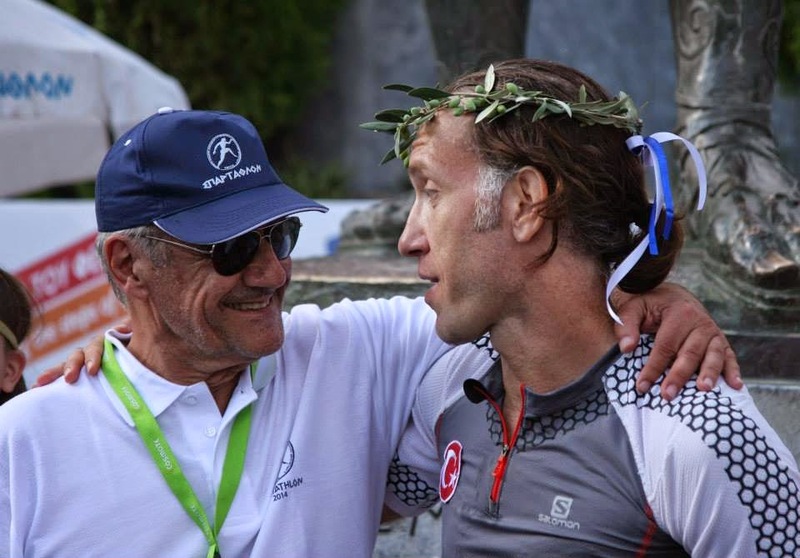 I will never get to the Spartathlon, the years have caught up with me, but your story has been a wonderful retelling of your footsteps. Thank you for dragging me along. Tesekkur ederim arkadaslar. @John, thank you very much. Nice to hear this from an experienced runner and a great author.